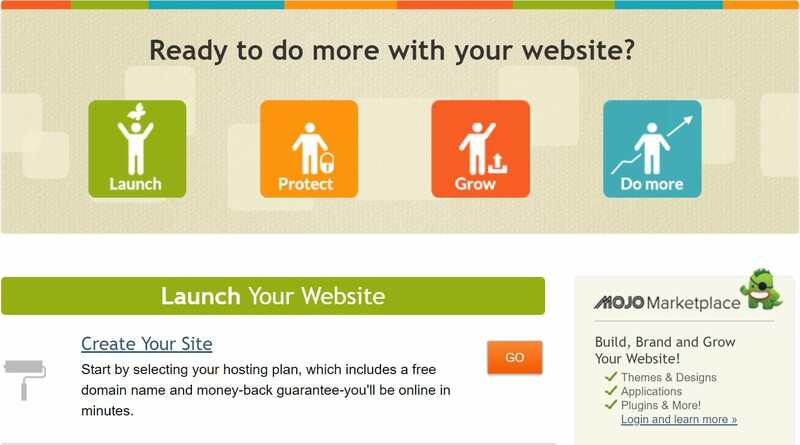 BizLand Review 2019: Is BizLand a Good Hosting? Bizland is a U.S.-based hosting provider and domain registration service that’s ideal for personal websites and small businesses. It offers several feature-packed Linux and Windows-based packages at low cost, in addition to plenty of free extras. Headquartered in the U.S., BizLand has more than ten years’ experience in the web hosting industry, targeting mainly startup individuals, small businesses, and e-commerce sites. BizLand has two data centers in the U.S., in Waltham and Boston. The website and customer support are available in English. BizLand’s shared hosting packages for Linux come with a lot of useful features, freebies, and backed by 99.9% uptime guarantee. The basic package gives you a large web space of 200 GB, 2000 GB bandwidth limit, FTP access, unlimited mailboxes, site management and enhancer tools, Perl, Python, PHP, SSI, Webalizer web statistics, and more. Spare a few bucks and you’ll get a free domain and larger storage space with higher packages. Although it would have been easier to use a cPanel, BizLand provides a custom vDeck control panel that requires the user to be more tech-savvy. Nevertheless, I like the freebie pack throwin with BizLand’s packages such as marketing tools, site builder and site creation tools, SSL certificates, SiteLock CDN, and MOJO Marketplace which helps you to install WordPress easily. It doesn’t stop just there, you also get free $100 Google Adwords and $100 Bing Ad credits with any package, which is great to give your website a good kick-start. As for the technical side, BizLand provides MySQL databases with its Linux hosting plans and Microsoft MySQL databases with its Windows hosting accounts. However, it doesn’t offer Remote MySQL connections or SSH access. You can also have Cron Jobs. Further, BizLand keeps website backups for 14 days and backups for database files for 3 days. It also uses SSD storage for database and Oracle for file storage. Generally speaking, BizLand offers feature-packed plans at relatively low prices. For example, you get a lot of benefits and generous disk space with the Charter plan which is the cheapest. Higher plans like Value, Pro, and Commerce include a free domain registration with annual subscription together with larger web space and higher bandwidth limit. It’s also worth noting that BizLand charges setup fees for its packages. On the downside, many unhappy customers reported having issues with BizLand’s security measures and billing policy, so I strongly recommend taking advantage of the company’s 30-day money-back guarantee to test their waters before committing to a long term subscription. You can pay for your preferred package via PayPal or a valid credit card. I had a great experience with BizLand’s customer support. 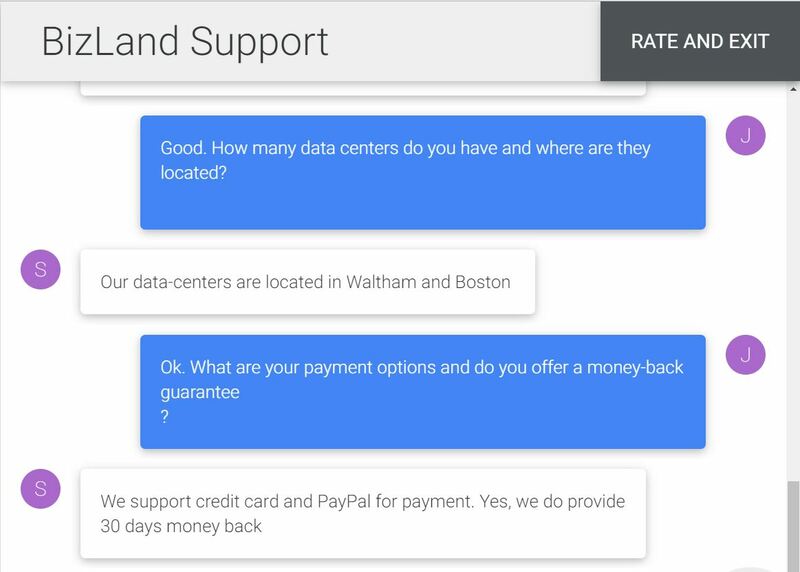 There’s a 24/7 live chat support channel which I tested by firing a bunch of basic and technical questions about the service. Swarna, the chat representative, was very polite, friendly, knowledgeable, and answered all my questions. If you don’t like to chat, you can give them a call. There’s also a Knowledgebase section, but it was down when I checked it. BizLand offers feature-rich hosting packages for both Linux and Windows at competitive prices. It also provides excellent live chat support and lots of freebies. However, a cPanel would have been a more user-friendly choice as a control panel instead of it custom vDeck panel. Wondering how BizLand stacks up against other Web Hosting companies? Enter any other Web Hosting company and we will give you a side-by-side comparison.